It happened again this past week. A conversation with a fellow ministry leader led us both to confess that the marks of ministry effectiveness left in the tracks of our years of service in churches were pretty non-grandiose, even downright mundane in nature. We both recalled anniversary year receptions, or services commemorating years of service as we prepared to leave one church field to go to another. We joked at how much time and effort was spent in preparing for large-scale music productions, weekly anthem presentation, and how little notoriety these activities produced for either of us compared to the simple and human ministries of presence, prayerful concern, and nurture. The two of us together have racked up a pretty good pile of years of ministry service. With that much experience to draw from, and openness of relationship to share, we each recounted the joy in the non-spectacular nature of our ministry lives. He talked about people who remembered when he showed up in hospital rooms, at funeral services, or prepared music for weddings. I responded with similar reflections and added remembrances of teens whose parents had blessed me by sharing thanks for a ministry of time investment in the lives of their “kids,” who were now parents themselves. It felt good to confess the absence of our own celebrity. It was edifying to find joy in the simplicity of the work of our hands; visiting the sick, tending the sheep, recognizing, teaching, and developing talents in the area of our craft, as well as making spiritual application. When this brother headed for the elevator I mentally relived moments shared in a hospital room with one of his children. The remembrance stirred again some of that heart-burning confidence like I sensed in the scenario itself that I was recalling. The source of the stirring was easily identified. You see on that day in that hospital room I knew Jesus was there with him, his wife, his child, and with me. I recall so well feeling a helplessness in my own power, but a confidence in the Lord’s love. In the early pages of his book, Sensing Jesus: Life and Ministry as a Human Being, Zack Eswine lays out solid reasoning for ministers to understand that we are not God. He distinguishes between aspects of God that are communicable and incommunicable. Being made in His image reminds us that He is personal, creative, loving, rational, truthful, and willing. These are characteristics with which we can identify and in our best humanity have capacity to reflect. On the other hand, we are NOT infinite, all-powerful, all-knowing, everywhere-present. These incommunicable attributes belong to God alone. Sadly, church culture, coupled with what is arguably our most tempting area of sin as ministers, prods us to grasp for these attributes and urges us to try and achieve them, or give appearance that they are already ours. We are tempted to order our calendars and schedules as if we can be everywhere. We act confident so as to imply that if we do not know everything, we are at least working toward it. What’s more, the knowledge we do have may be serving more to prop up our charade than to actually aid our follow-ship and knowledge of Jesus. Living in this sinful condition we become trapped – left protecting our own image, rather than reflecting the image in which we have been made. “Loving our neighbor as ourself” too sadly downgrades into appearing to love neighbor in order to build up ourself. Like Adam and Eve we are tempted to believe the devil’s lie, “If you eat of this tree you surely will not die, but will be like God.” Thinking this way is sinful and kills. For Worship Music Leaders as for pastors there is a severe danger in this dreadful arena. The pressure to present a certain image is epidemic in today’s church, and the image that is expected, I am saddened to say, does not appear to be much like Jesus, who came to serve, not to be served. At the risk of being misunderstood, think openly and analytically about the trajectory of many present-day worship environments. What is the image presented? Is it crystal clear that we are seeking to make much of Christ? We need the grace of God. We need a Savior to deliver us from expectations that were never meant for us to have, to return us to a grasp of our humanity. In his book, Eswine reminds us that only by surrendering to our proper human place can we glorify and enjoy God the way we say we want and the way He requires. He points to the freedom and joy of re-positioning ourselves to be fully human, which takes place in worship as we see God for Who He is in His proper place of Lordship, and seek to serve Him through the life He has given, the work of our hands, and the joyful devotion of our surrendered heart. 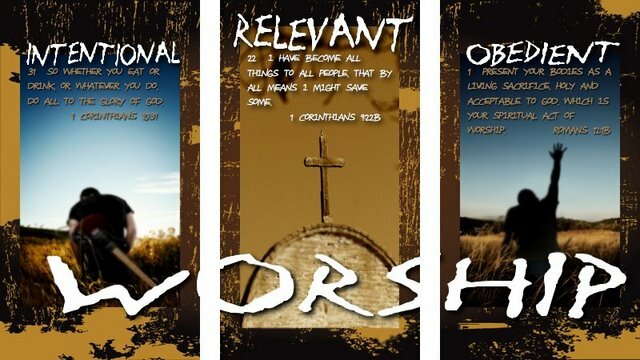 Surely, as this pleases Him, this is what it means to worship.